Before the meeting, Russian President visited the Ryazan Tannery, where he looked over the leather-working and tanning shop, dyeing shop and the facilities producing leather for automotive and aircraft manufacturing industry needs. 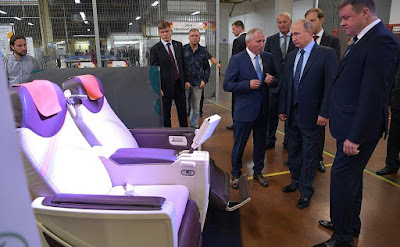 Vladimir Putin spoke with the factory’s workers and had a look at some of the goods produced by light industry enterprises. 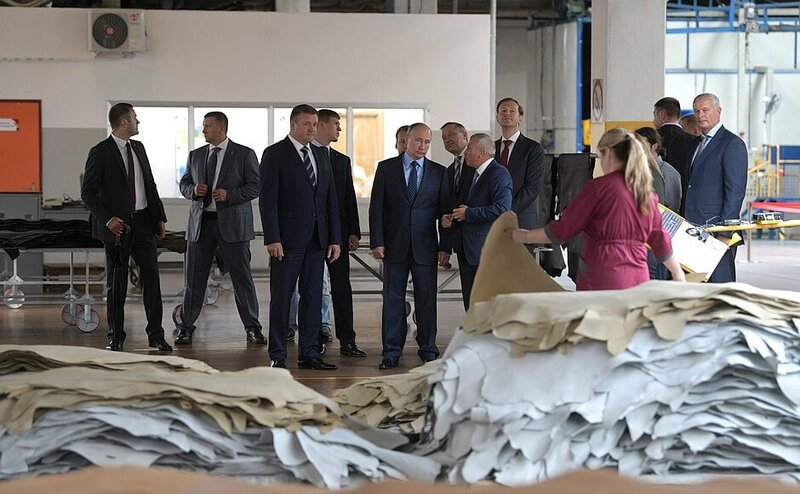 Ryazan Tannery is part of Russian Leather Group of Companies, Russia’s biggest genuine leather producer, which accounts for 35 percent of all leather production in the country. The factory currently produces practically all types of genuine leather for shoes, furniture, clothing and haberdashery. The business delivers its goods to companies in Russia, Italy, Portugal, Spain, France and a number of Asian countries. We met to discuss and address the problems and issues facing light industry sector in March 2013 in Vologda, and some colleagues have recalled that meeting today. We are returning to this matter today, and, together with the heads of leading companies in the sector and business association representatives, we will analyze the sector’s problems and outline concrete steps to develop it. Vladimir Putin at a meeting on developing light industry. Much has changed since 2013. The sector and the economy in general have transformed. They have faced the objective difficulties that we know, and at the same time, Russian manufacturers have also gained new opportunities arising, above all, from the import replacement drive. I note that Russia’s light industry is gradually entering a growth phase now. Last year, the textile, sewing, and leather and shoemaking segments were up by around five percent, and all three segments posted growth of approximately 6 percent for the first half of this year. We are seeing the emergence and development of modern, competitive businesses that find their place on the domestic market and have good export potential too. We are meeting at one such enterprise today. I looked at the reference materials before, and we heard from Igor Surin [Chairman of the Board of Directors of Russian Leaver Group of Companies] that this is the biggest leather producer in Europe. This is wonderful to hear and I congratulate Mr. Surin and his entire team of staff and workers on this. He told me with pride just before about the technology they use here, their efforts to achieve the highest quality standards, and the impact this has on sales. 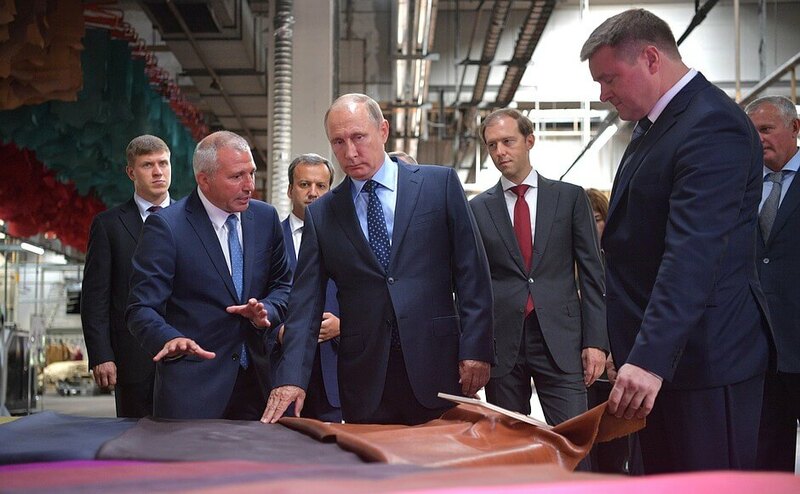 Vladimir Putin visited Ryazan Tannery and got an overview of the company’s main activities. It is important to support business activity growth in light industry and encourage the emergence of successful new enterprises. Of course, we also need to resolve the systemic issues that are holding back the sector’s effective development. Many of these problems are of a chronic nature, unfortunately, particularly the fight against counterfeit goods and smuggling, which not only undermine competition on the domestic market but are a clear threat to our citizens’ health. Let me give you a few figures. In 2013, when this issue was first raised and relevant instructions were issued, smuggled goods illegally brought into Russian customs territory accounted for 39 percent of retail sales, or around 1.1 trillion rubles. Today, the figure has come down, but we are still looking at 33 percent, or 860 billion rubles in sales. 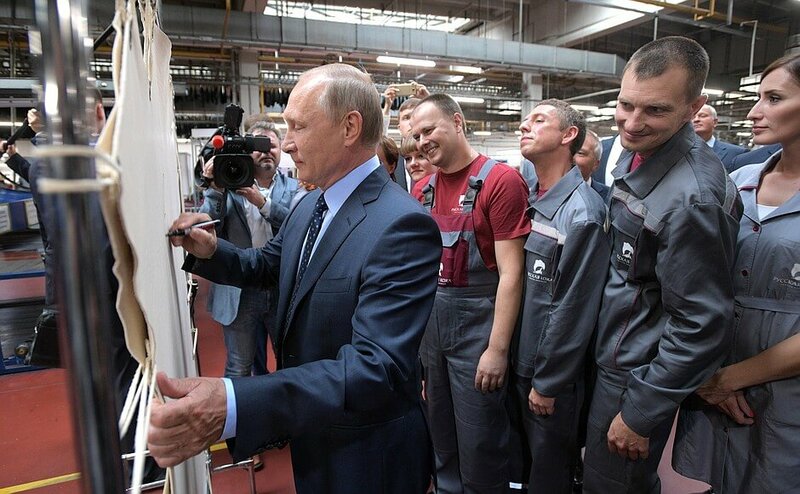 Vladimir Putin during his visit to Ryazan Tannery. Let me say that this is not a very convincing dynamic for these last three years, colleagues. I want to hear from you how each of you in your area views this problem, what steps you propose, what is getting in the way of regulating this problem, and what additional protective and regulatory measures we need to block this flow of illegal imports. I stress here that counterfeit and smuggled goods devalue and hollow out the state support measures we provide for those working legally. I was very happy to hear today that the measures the Government has been taking to support the sector are having an effect. This is reflected in what we see at concrete enterprises. But they would work far more effectively if it were not for the negative factors I mentioned just before, counterfeit goods and illegal import of foreign-made goods to our country. 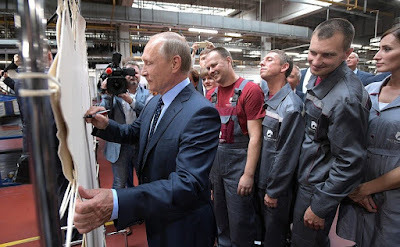 Vladimir Putin visited Ryazan Tannery. I think that cleansing the market of dubious goods is an essential resource for developing light industry. Let’s reflect together on what additional steps we can take in this direction. Another issue I want to examine concerns raw material supplies for our enterprises. As far as I know, the domestic market is experiencing a deficit in natural fibers and materials and their quality often falls below the standards demanded by the processing industries. This matter has also been mentioned today. Flexible solutions are needed here to stimulate local production of these materials and at the same time cover manufacturers’ current demand. In this context, I propose discussing the launch of a sub-program within the state program on agriculture. Arkady Dvorkovich [Deputy Prime Minister], I ask you to give this your attention. We have our first concrete example here today. Livestock suffer if they are not vaccinated in time, and this leads to a lower quality of raw materials later. I also think it is important to address the issue of removing excessive barriers for importing quality raw materials in cases where there is an objective need. Let’s discuss this matter too today. Vladimir Putin held a meeting on developing light industry. We also need to develop light industry’s human resource potential, return these profession’s prestige, and attract young specialists into the sector. The main educational institutions working in this area are concentrated in Moscow today, but the actual production facilities are located mostly in the regions. This situation requires thorough analysis. Future personnel should study in the locations where they will be able to gain practical experience and apply what they are taught in real life. Among other things, I propose examining the possibility of opening relevant faculties at the main companies in the sector. Another very sensitive issue for young people and for all working in the sector is the wage level. The wage level at this company we are visiting today is higher than the region’s average, but this is not the case throughout the sector as a whole, unfortunately. From 2013 to 2016, the earnings each person employed in the sector was generating increased by 60 percent, but wages increased by approximately a third, and came to 18,600 rubles a month on average in the sector as at the end of last year. This is considerably lower than the average for the economy as a whole. I propose that we reflect on what we can do to improve this situation and which measures are needed to attract young people into light industry sector. 0 Comment to "Putin attended a meeting on developing light industry"